The Notre-Dame-de-Bon Secours Chapel in Old Montreal, Quebec in Canada is one of the oldest churches in the area and atop the chapel stands a beautiful statue of an angel. 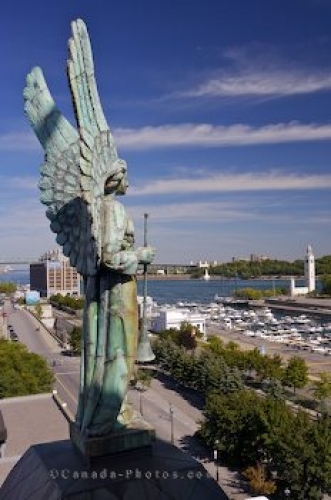 From this point of view, the angel watches over Old Port where boats are moored at the yacht club and the clock tower adorns the waterfront. Once a wooden chapel erected in 1655, rebuilt in stone in the late 1670's until it burnt in 1754, a new stone structure which stands today replaced it. The herald angel statue atop the Notre-Dame-de-Bon-Secours chapel is one of many incredible statues to see, this angel very noticeable due to its prominent location. Picture of the angel statue atop the Notre Dame de Bon Secours Chapel in Old Montreal, Quebec. Angel atop the Notre-Dame-de-Bon-Secours Chapel overlooking the Old Port Clock Tower and Yacht Club Montreal in Old Montreal, Montreal city, Quebec, Canada.